Discipline, by its nature, is force. Punishment. To be disciplined is to be punished. I have trying my whole life to be more disciplined… believing that I am an absolute failure at taking enough of the right action at the right time. I have built constructs and entire businesses even in order to FORCE myself to ‘be more disciplined’. 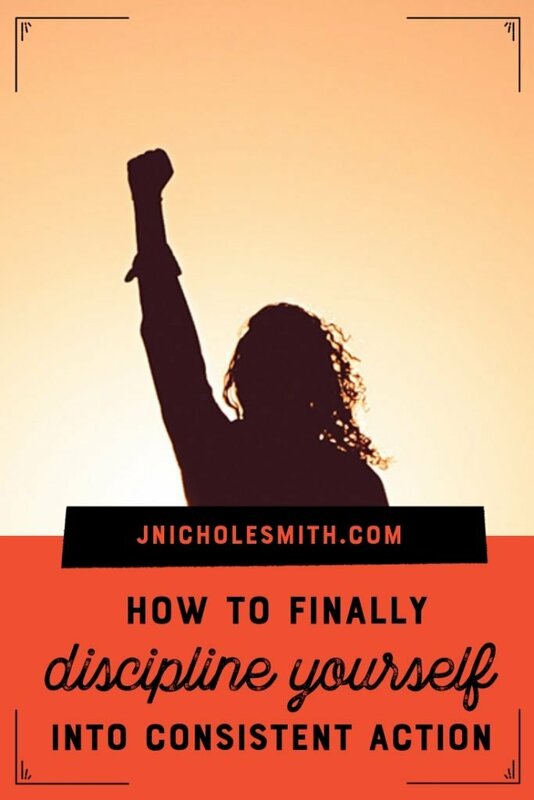 We probably all over our own definitions of discipline: for me, discipline means finishing what I start, not procrastinating, using more will-power more often, and just DOING the stuff I find impossible to DO. So what is all of that stuff really, if you were to examine it under a microscope? What is actually driving all that procrastination, perfectionism and stalling? Does discipline heal feelings of ‘not enoughness’ or inadequacies? Well the first two are obvious no’s. But it’s that tricky third one that has led us to believe discipline is useful. Disciplined, consistent action CAN lead to change. If you look at the words used in the description of being ‘disciplined’ I mentioned at the beginning, you’ll see words like drill, order, obedience, control, punish, penalize, control, correct, chastise. Do these things create change? Sure! When you’re forced to be obedient and punished when you’re not, you’re likely to change your behavior. Real-life examples of ‘successful’ discipline are easy to spot. How about military basic training (my worst nightmare by the way), or old-school methods of dog and horse training … although different in their specific techniques and subjects, these extreme traditions have one objective in common: to break the spirit of the soul they’re ‘training’ in order to exert consistent control over them. How do they break their subjects? Extreme fear-based training techniques, using physical and psychological pain as tools. Luckily, for most of us humans, we are in charge of our own destiny, and we have a choice to not subject ourselves to being broken, and yet in our own internal narrative we’re using these techniques all the time. This seems counterintuitive since really, our desire is to be the opposite of broken, to be whole… and to have the opposite of a boss or master: we crave freedom and for the most part we seek physical and psychological ease and pleasure. We all deserve to be free, at ease and happy. But we continue to force, punish, and break ourselves because we’ve been raised on several myths about happiness… that our happy will arrive once we fit in perfectly with society’s expectations: have the perfect hair, eyes, skin, body, car, house, career, be the perfect parent, partner, friend, find our creative self, travel the world and care expertly for our aging parents. All at the same time! And…. you guessed it… we are taught that we will ACQUIRE these things by SUFFERING. By being MORE DISCIPLINED. Disciplined to have enough willpower to starve ourselves properly to fit into that next size down, or suffer enough indignity at work that we can just make it to that next pay grade or bonus… or force ourselves into more tasks or more hours in our own businesses to prove that we can do it, that we care and that we’re giving it our all… to pretend we’re not hurting in our minds, and in our relationships so we don’t risk being different or alone. No. No the constructs of the first world we live in do not lead us easily to happiness and discipline is one of the chief lies of that deluded fantasy. Now, I know what you’re thinking? What’s the alternative? All I can think of when I think of a lack of discipline is other people’s obnoxious, unruly children or dogs and let’s be honest, our obsession with disciplining ourselves as adults definitely comes from our having been taught about discipline first-hand as a kid. What about us entrepreneurs, just trying to get MORE done in LESS time to make MORE money – we just have to figure out a way to work a bit harder (or clone ourselves or find more hours in each day, right)? Surely we need discipline for that!? Focus on setting ourselves up for success, and rewarding our small wins, instead of punishing ourselves for falling short. Sound too ‘woo woo’ for you? “Neuroscience suggests that when it comes to motivating action (for example, getting people to work longer hours or producing star reports), rewards may be more effective than punishments. And the inverse is true when trying to deter people from acting (for example, discouraging people from sharing privileged information or using the organization’s resources for private purposes) — in this case, punishments are more effective. The reason relates to the characteristics of the world we live in. To reap rewards in life, whether it is a piece of cherry pie, a loved one, or a promotion, we usually need to act, to approach. So our brain has evolved to accommodate an environment in which often the best way to gain rewards is to take action. When we expect something good, our brain initiates a “go” signal. This signal is triggered by dopaminergic neurons deep in the mid-brain that move up through the brain to the motor cortex, which controls action. What I find so interesting about this – the bit that we can control – is that we can set up a system where we anticipate rewards for taking action. How? Because we control the rewards! Additionally, we need the desire for the reward to be stronger than our desire to do nothing because we fear a negative outcome (which for most of us entrepreneurs includes big monsters like failure, criticism or judgement). Punished behavior is not forgotten, it’s suppressed – behavior returns when punishment is no longer present. Punishment Causes increased aggression – shows that aggression is a way to cope with problems. There are plenty of studies out there about how and why all of this works, not just with us entrepreneurs of course, but regular adults, children, and animals as well. Well we know that discipline is a form of negative reinforcement or punishment, and we know that neither negative reinforcement or punishment are as likely to get us to the place we desire as positive reinforcement (or rewards) – but how do we actually turn that into actions or habits that help us see results? I believe as an entrepreneurs it is in our best interest to create a 4-part cycle which becomes ingrained in our workday, our week, and eventually, our life. The first part is positive reinforcement for our small milestones. Now although superficial treats like food, buying ourselves a gift, taking a walk, or meeting a friend for lunch are all nice rewards… what I have found to be the most effective reward are mementos of genuine self-love. Although I know this sounds annoyingly fluffy, the reality is that the feeling at the root of our ability to really get more done AND feel pride and happiness about our accomplishments AND play well with others (in work, or in life) is to practice (not just think about but actually practice) self-love. 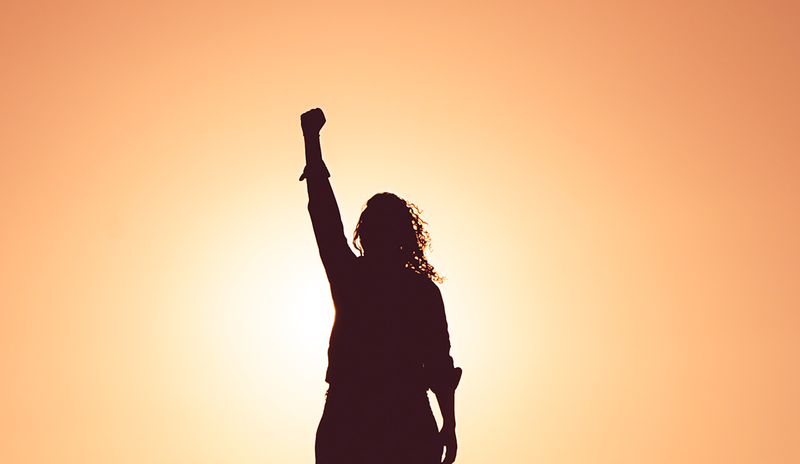 Reinforcing our belief that we are loveable, valuable, humans, worthy of praise and success has been the #1 productivity hack I’ve ever tried (and trust me, in 13 years of entrepreneurship, I’ve tried it ALL). The most effective rewards you can give yourself are genuine acts of self love. Big or small, it doesn’t matter. Now, not all rewards are equal… although in a pinch the odd bit of chocolate, or a glass of wine or luxurious purchase can be VERY motivating – you just want to be careful about choosing rewards that are actually loving, and not some subversive form of punishment. What do I mean by that? Well the difference between a real act of self love, and punishment masquerading as a reward is the way you feel AFTERWARDS. Sugar comas, hangovers, guilt and financial woes can dump us straight back into self loathing, so you want to work on picking the rewards that are truly loving for YOU based on the pleasure they will bring you during AND after. This may be slow and challenging work – but keep in mind, these beliefs have probably been hanging around in you since early childhood, so be gentle with yourself as you sink into trying to root them out. But don’t wait. Start now. Below are links to a few books that have really helped me start this work myself. I know it will be easy for you to brush this off as ‘not for you’ or ‘not a priority’ – and you’d probably much rather just get a marketing hack for how to double your instagram audience, or a productivity tool that will finally help you get through your to-do list every day – but I promise you – this is it. Being kind and empathetic with ourselves, instead of being hateful drill sargeants is how you’ll get there. Now, the self-love journey will be ongoing, and it does get easier as you go – but as you begin to treat yourself with love, you’ll soon discover the second part of your cycle: boundaries. An absolutely essential part of getting more comfortable in your own skin, in your own business, is setting boundaries with yourself and especially with others. This is what allows us to create safe spaces for our growth and our needs. Instead of looking to ‘punish’ or ‘discipline’ yourself, look to create some hard lines for yourself that you just don’t cross. This can include things like work hours or days off, or perhaps making things you enjoy in the morning non-negotiable like a workout, writing time or a leisurely cup of coffee – believe it or not setting and respecting these boundaries are acts of self-love. It’s you proving to yourself in small and big ways that you deserve respect and care. Next week we’ll discuss the ‘Graceful NO’ and how to set these boundaries with other people… but it does start with your ability to set them for yourself. Pick one thing that’s non-negotiable in your daily routine, and start setting a hard boundary for yourself. Each time you love yourself enough to hold that line, you’ll love yourself a little more. This is how growth happens. You’ll probably also find that the byproduct of this boundary setting and honoring is a better mood and more energy to get through your work with ease. The third part of our cycle is communication. A critical part of growing your self-love and increasing your boundary setting and honoring is being able to communicate with yourself and others. Like I mentioned we’ll dive more into this next week, including that ever-awful ‘how to say no’ question – but as you go along not only talking about what’s going on with you, and avoiding the temptation to withdraw and figure it out all by yourself – but also to explore outlets like journaling and even seeking out conversations with professionals like counselors, healers, coaches and mentors. Not only will this help you figure out what you think and feel, but it will also allow other people who have more perspective to help keep you grounded and encouraged (and they will be good at reminding you to celebrate those little wins when you’ll be tempted to ignore them or dismiss them). The fourth part of our cycle is the one you’ve been waiting for: action. One of the best ways to instantly feel better about the things you’re stressing about is to DO something, to take action. Plus, all this ‘in the head’ stuff is great (and super important) but at some point you’ll have to actually do stuff. The beautiful part about this whole cycle though – is that by the time you’ve gone through the first three – action will feel EASY. This is how you’ll access that mythical ‘flow’ more often. This is how you’ll do 10x as much stuff in half the time. This is the part where you get to really see the outer results of your inner work – but the difference is that now you’re LOVING yourself through it, instead of hating and punishing yourself. It will happen because you WANT it, not because you HAVE to. PLus, don’t forget when you take that action, get that thing done, make those strides, achieve those results, you reward your little success, and the cycle begins all over again! Isn’t all of this so selfish? ‘Selfish’ or not, annoyingly, this is the key to it ALL. Learning to love yourself more than anything else. This is THE essential answer to having more, doing more, caring better, selling more, having more and serving more fully. But, I know when you hear this, or read it, you’ll probably hate it. It will feel selfish, it will sound impossible. I felt the same 6 months ago. Even though I would have read this same advice probably 100 times. But I can tell you, from just a few short months of applying this cycle (which is WAY hard, I’m not going to sugar coat it, it’s going to take longer than you like … ) what I’ve found in a few short months, is that after a LIFETIME of trying to force, shove, punish myself into submission – treating myself with love, and putting myself first over anything external – is working. I am doing more, my work is more rich, I am showing up for my clients wholly, I am managing multiple business and up’s and downs of entrepreneurship with less panic and anxiety, I am a more kind and present wife and doggy mamma – with more patience and love to give, I am treating my body better and in return it is slimming down, it’s pain free, my skin and nails look great, I suddenly have time to do things like exercise, shop, plan and cook healthy food – it’s like some sort of magic spell. And you know what? It doesn’t feel hard anymore! It just keeps getting easier! The more we give in to the cycle, the better we feel, the more we get done, and the more pleasant we are to be around. Never again will it be on your list of words for the year, goals, or things you wished you were better at. Trade it out for self- love and not just your business, but your whole life will improve for the better. That’s it for Episode 7 of the Magic Maker podcast – welcome to the headquarters of entrepreneurs who want to do good, be real, find happy and build brands that matter. Next week, we’ll be diving into the ‘graceful no’ and how to communicate your needs, even when you’re scared they will make you difficult or unpopular. This is a key part of becoming a more confident leader, so be sure to subscribe so you don’t miss it! Of course, we would be so grateful if you would be willing to invest a few moments of your precious time by giving reviewing this podcast on iTunes, so we can reach more magic makers and help too, to change their lives, and the world. 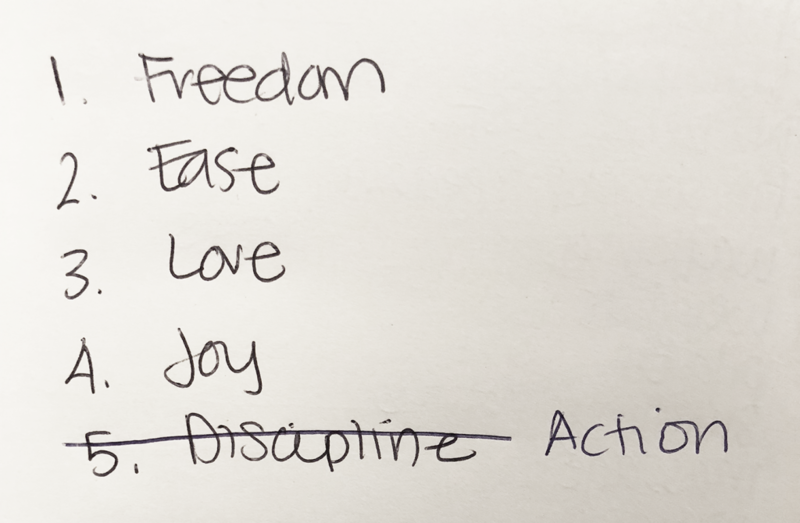 After several months of research on human happiness and what actually works for entrepreneurs – I ditched discipline forever and replaced it with ACTION. Here’s to all of us LOVING ourselves into action, instead of glorifying punishment and force.